This is the story of an intelligent young girl who escapes the contempt of her misogynous Priest father. Following the death of her eldest brother Matthew, Joan and her other brother, John travel to a schola (school) where they are both educated and taught to read (a rare opportunity for a woman in this era). Following a Viking attack on their village (of which Joan is the sole survivor), Joan pretends to be her brother and dresses as a man to protect herself as she flees to the monastery of Fulda. Retaining the identity of her brother, she is initiated into the brotherhood as Brother John Anglicus. Joan becomes a great scholar and healer and eventually decides to travel to Rome to further her knowledge and reduce the risk of her true identity being revealed. Once in Rome, Joan’s intelligence and quick-thinking are rewarded as she becomes the personal physician to the Pope Sergius. Through some fortunate twists of fate, Joan is soon reunited with her one true love, Gerold and rises through the ranks to become the first female Pope. But Joan is forced to make a decision between love and power…and pay the price. Woolfolk Cross’ vivid description of life during the 9th century demonstrates significant research into society and culture throughout Europe’s Dark Ages. Despite being labelled as “Fiction”, I finished the book feeling like I had been thoroughly educated about this period, especially on key events such as the Borgo fire that destroyed over three-quarters of the Vatican, and the Battle of Fontenoy, resulting in the loss of around 40,000 men. The book raises women’s age-old dilemma of balancing family and career, whilst exploring themes of gender equality, love, religion, politics and power. The further you get through the book (or if you read anything about this story before reading the book) the more predictable the ending becomes. There are other ways I would have liked the book to end, but since the book is based on historical events, I understand this isn’t possible and enjoyed it regardless. 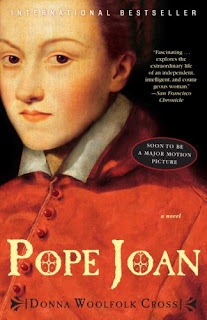 The legend of Pope Joan is a fascinating mystery. Despite being set over a thousand years ago, Joan faces and overcomes challenges that are relatable and similar to the ones faced by women (and men) today.